I hope you never say that you’ve had enough with the pot pie recipes around here. Because you guys would break my heart. 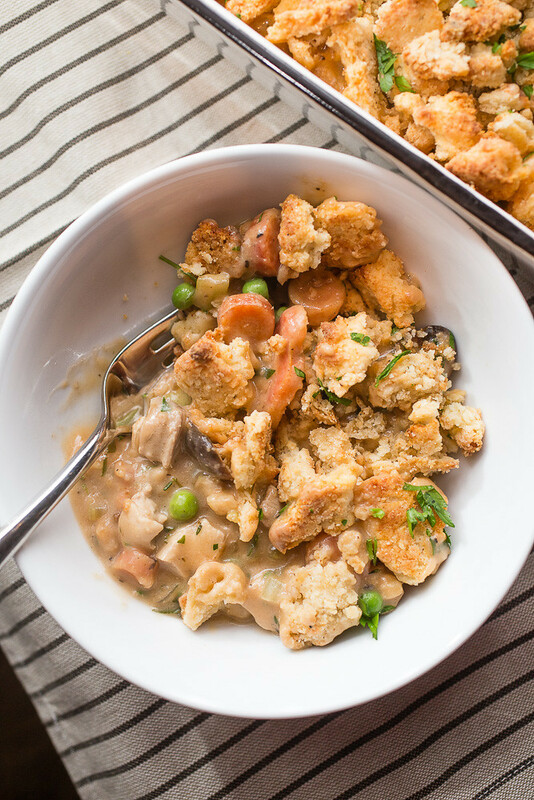 Aside from this chicken pot pie with savory crumble topping, a mouthful – no pun intended – of a recipe name in and of itself, I’ve got two more on my list to make this fall and coming winter. Please don’t ever tire of these types of recipes! But first, this chicken pot pie for a crowd. Not unlike apple pie for a crowd or one of my earlier favorite crowd-pleasers (and yours too), this one makes a lot of food. And it’s the reason why I waited until we had some family in to visit a few weekends ago to make this pot pie since it’s an overwhelming amount of food for two people. It’s not a quick meal to pull together either, but it’s an easy one if you’ve got some prep help (thanks, Mom! ), made in one pot despite several steps, and it’s quite perfect to make on a chilly weekend evening. We found ourselves snacking on some cheese and crackers and having a couple cocktails while whirling around the kitchen sauteing, stirring, and baking; absolutely my favorite kind of weekend cooking. And to shorten the recipe, you could certainly use a rotisserie chicken and some chicken broth instead of poaching the chicken and using the remaining broth. It’s totally your call! 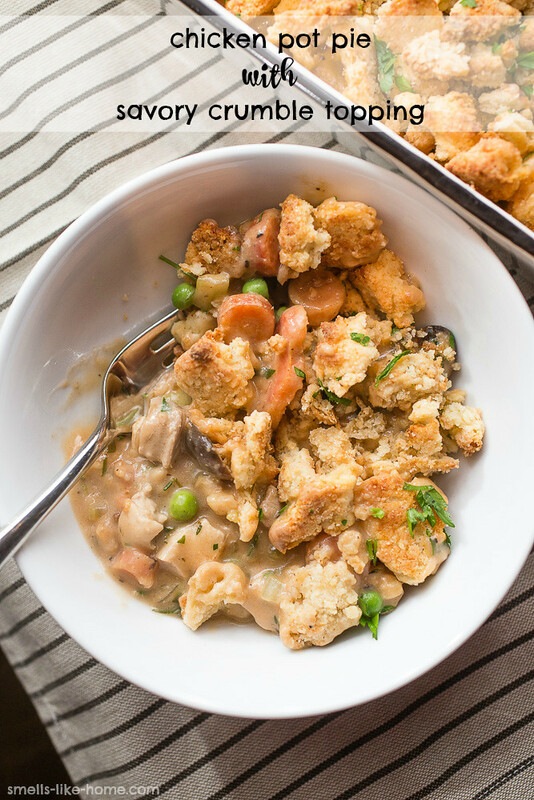 In short though, this chicken pot pie with savory crumble topping is the BOMB! I’ve made it a before: a few years ago during my first visit with a few of my greatest friends so sharing this fantastic meal with my family recently just made me completely giddy. I knew it was a winner, was confident they would love it (they did), and couldn’t wait to get it on the kitchen table. 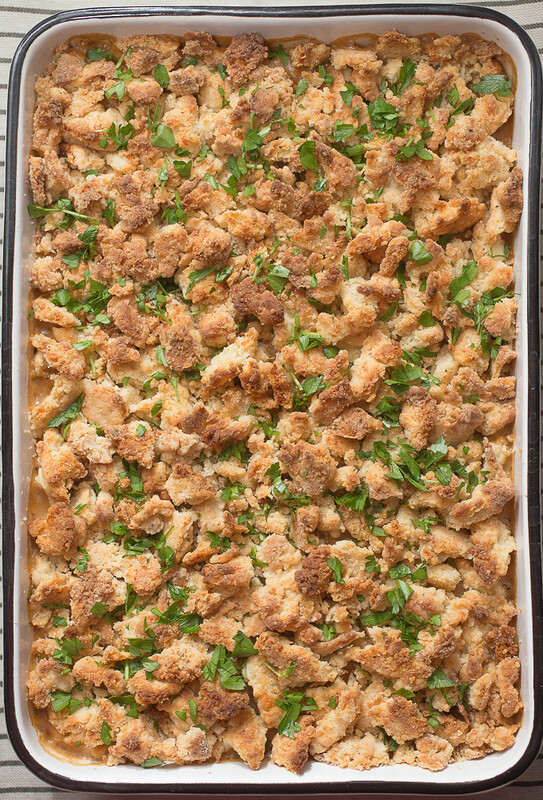 It’s hard to tell which is the best part – the homey, thick, and stewy chicken and vegetable filling or the nearly obnoxious amount of crunchy, crumbly, and savory crumble topping. But since you don’t really have to choose between the two, you may as well just enjoy as much of both as your belly can handle. I certainly did. To make the chicken: Bring chicken and broth to simmer in covered large (at least 5qt) Dutch oven over medium heat. Cook until chicken is just done (160° F), 8 to 12 minutes. Transfer cooked chicken to a large bowl. Pour broth through a fine-mesh strainer into a 4-cup liquid measuring cup and set aside. Do not wash out the pot. Meanwhile, adjust oven rack to upper-middle position and heat oven to 450° F. Line a large baking sheet with parchment paper. To make the topping: Whisk flour, baking powder, salt, black pepper, and cayenne pepper together in large bowl. Sprinkle butter pieces over top of flour. Using your fingers, rub butter into flour mixture until it resembles coarse cornmeal (or cut the butter in with a pastry cutter or two knives). Stir in Parmesan cheese. Pour the cream over the mixture and stir until just combined – do not over mix. Crumble the mixture into irregularly shaped pieces ranging from ½ to ¾ inches each onto the prepared baking sheet. Bake until fragrant and lightly brown, about 10 to 13 minutes. Set aside to cool. While the crumble bakes, start the filling. To make the filling: Heat 1 tablespoon oil in now-empty Dutch oven over medium heat until shimmering. Add onion, carrots, celery, thyme, ¼ teaspoon salt, and ¼ teaspoon black pepper. Cover and cook, stirring occasionally, until just tender, 5 to 7 minutes. While vegetables are cooking, shred or cut the chicken into small bite-size pieces. Transfer the cooked vegetables to the bowl with the chicken; set aside. In the pot, heat the remaining oil over medium heat until shimmering and toss in the mushrooms. Cover and cook, stirring occasionally, until mushrooms have released their juices, about 5 minutes. Remove cover and stir in soy sauce and tomato paste. Increase heat to medium-high and cook, stirring frequently, until liquid has evaporated, mushrooms are well browned, and dark fond begins to form on surface of pan, about 5 minutes. Transfer mushrooms to bowl with chicken and vegetables; set aside. Over medium heat, melt the butter in the pot and when foaming subsides, stir in the flour and cook for 1 minute. Slowly whisk in reserved chicken broth a few tablespoons at a time to avoid making lumps and then whisk in the milk. Bring to simmer, scraping pan bottom with wooden spoon to loosen browned bits, then continue to simmer until sauce fully thickens, about 1 minute. Season to taste with salt and pepper. Remove from heat and stir in lemon juice and 2 tablespoons parsley. Stir the chicken-vegetable mixture and frozen peas into the sauce. Pour mixture into 13 x 9-inch baking dish or casserole dish of similar size. Scatter the crumble topping evenly over the filling. Bake on a rimmed baking sheet until the filling is bubbling and topping is well-browned, about 12 to 15 minutes. Sprinkle with remaining tablespoon of parsley before serving. Aww yay! This recipe always brings me back to that night in my kitchen, laughing and cooking and eating. It’s one of my favorite memories. neeeever too many pot pie recipes! Love it! It’s in the rotation for at least once a month! I normally wait until I have leftover veggies from the week and raid the fridge of them to make this, so it saves me from waste, and it tastes AMAZING! I stole an idea from a different recipe to spice this up, however. I add 1.5 to 2 teaspoons of freshly ground black pepper and mix it in with the topping. WOW! This is awesome to hear! And I love the idea about making a peppery crumble topping – sounds delish! Absolutely love love love this recipe! Saw them make it on the America’s Test Kitchen tv program a few yrs ago & just had to make it. I followed their recipe, and you are right it does take some time to make. To save time l am using rotisserie chicken this time and starting it today, for supper tomorrow, so l can take my time making it. It lends itself to preparing ahead of time. I will make the topping ahead but will not add until tomorrow. Planning to have asparagus and a salad with it. Since l am counting carbs (diabetic diet), the nutrition information would be very helpful. Hi Donna! I love your time saving/make ahead ideas! Rotisserie chicken is SUCH a life-saver for meals like this! I don’t include nutrition information for my recipes as I haven’t yet found a reliable enough nutrition calculator for this purpose. But, Google has a built in nutrition calculator. If you search for something like “how many carbs are in 4 tablespoons of flour”, it will give you the # of grams. So for this recipe, you would enter the amounts of ingredients with carbs and then divide the result by the number of servings for this recipe (8). If there are multiple ingredients with carbs, search for them separately, add the grams for each together and then divide by 8. I hope this helps!